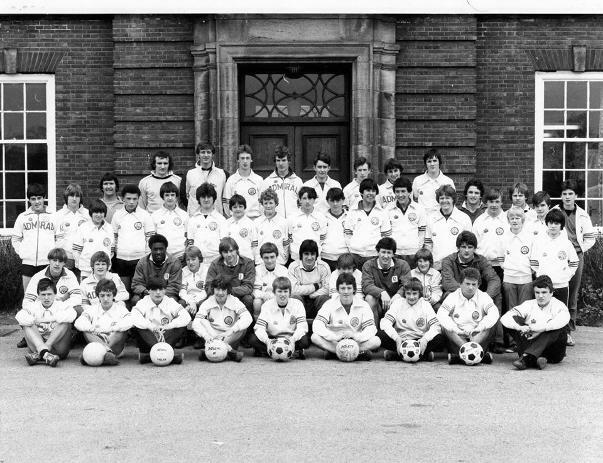 I have received this photograph from my cousin, Brian Butcher, who had trials with Leeds during the 1981/82 season. As you can see there are many faces we recognise but it would be fantastic if we could name the others. If you can spot anyone, other than those listed below, please post a comment or contact me here. Thanks to those of you on Twitter who have got involved in this. Kevin Hird, Allan Clarke, Peter Swan (2nd to Sniffer's right as you look), Barry Murphy, Terry Phelan (his head is between Murphy and Hird), next to Phelan is Tony Gregory (who ended up at Sheffield Wednesday), John Sheridan (in front of Swan, two to his right as you look), Frankie Gray, Arthur Graham, Mark Gavin (to Graham's right as you look), Terry Connor, Brian Greenhoff, Brian Butcher is the middle of them, Gwyn Thomas, Derek Parlane, John Lukic. In the middle of Parlane and Lukic is Simon Grayson.